After two successful festivals, Bitters ‘n Twisted is aiming to appeal to more cider drinkers as the third annual Ciderfest expands to four of its venues with a best of British theme. The Victoria on John Bright St and The Jekyll & Hyde based on Steelhouse Lane, both located in the city centre, have been joined by Jewellery Quarter based Rose Villa Tavern and Harborne’s New Inn for a fortnightly celebration of all things cider and its pear counterpart, perry. Joining in with the patriotic season, members of staff at the venues have gone for a Best of British theme with home-grown ciders and perries from Suffolk, Somerset and Cornwall amongst those that have been chosen. 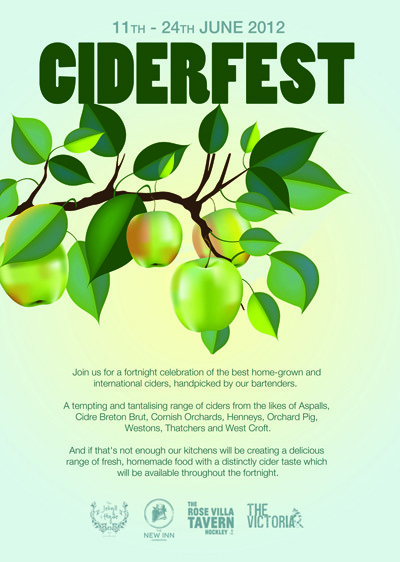 The Festival aims to educate Brummies into what makes a refreshing, authentic summer drink, with ciders chosen showcasing traditional and award-winning ciders. The venues’ kitchens will also be whipping up apple-inspired specials for the fortnightly celebration. Matt Scriven, director of Bitters ‘n Twisted venues, said: “With the Olympics, Jubilee and football tournaments happening this summer everyone seems to be using any excuse to jump on the patriotic bandwagon. We wanted to celebrate the best of Britain but in a way that offered something different to drinkers and with the amount of good quality ciders and perries we have in this country it seemed the perfect opportunity to combine the two.